Singer Jason Aldean has canceled a series of shows he had planned in Southern California this weekend out of respect for the victims of the Las Vegas shooting. Aldean was on stage at the Route 91 country music festival on Sunday when gunman Stephen Paddock opened fire from the 32nd floor of the Mandalay Bay hotel, killing 59 people and injuring more than 500. "As a result of what happened in Las Vegas this week, we have decided to cancel this coming weekend's shows," Aldean said. "I feel like out of respect for the victims, their families and our fans, it is the right thing to do." 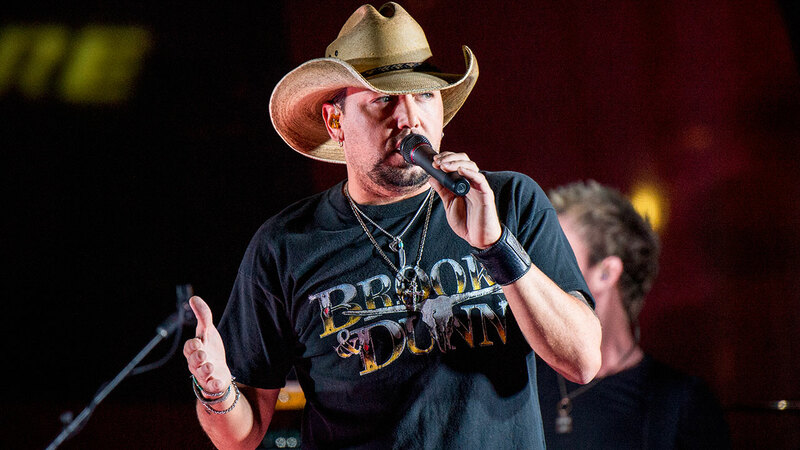 Aldean had shows on his "They Don't Know" tour scheduled in Los Angeles, San Diego and Anaheim. His tour will resume Oct. 12 in Tulsa, Oklahoma. "It has been an emotional time for everyone involved this week, so we plan to take some time to mourn the ones we have lost and be close with our family and friends," Aldean said. "Our plan is to resume the tour the following week in Tulsa, Oklahoma. Our first time back onstage will be a very tough and emotional thing for us, but we will all get through it together and honor the people we lost by doing the only thing we know how to do - play our songs for them. I hope everyone understands why we can't play this weekend and I'm sorry if anyone is disappointed." "I want to say thank you for the outpouring of love from my friends and fans we have received over the last couple days. You guys have no idea how much you have helped get us through this tough time." Refunds for the canceled shows are available at the point of purchase. Aldean also posted on his Instagram account a plea for greater unity: "My heart aches for the Victims and their families of this Senseless act. I am so sorry for the hurt and pain everyone is feeling right now and there are no words i can say to to take that pain away. Just know u all are in my heart and my prayers as we all go through this together. Time to come together and stop the hate!"